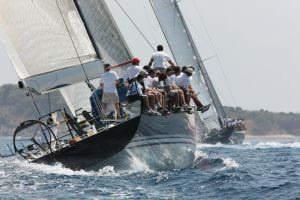 March 5, 2010, Simpson Bay, St. Maarten – After an extremely close, tactical, race on the opening day of the St. Maarten Heineken Regatta, Tom and Dotty Hill’s custom Reichel/Pugh 75 – Titan 15, managed to hold off George David’s Reichel/Pugh 90 Rambler and Irvine Laidlaw’s Wally 82 Highland Fling to take top spot in the St Maarten Round the Island Race. Peter Isler and team aboard this stunning new, ultra lightweight racing machine enjoyed an extremely testing 32nm race round the island of St Maarten in unusually light, southerly winds which only reached 12kts at best. They engaged in an early bow-to-bow battle with Rambler and Highland Fling from the start and, although Rambler soon powered off in the building gusts on the first spinnaker leg to the western most point of the island, Titan and Highland Fling were always snapping at her heels.